Hua Hin is a relaxing beach city located approximately three hours from Bangkok. Discovered as a holiday destination in the 1920s by King Rama VII, Hua Hin has since developed into one of Thailand’s most popular beach towns. Unlike Pattaya, Bang Saen and other beach resorts close to Bangkok, Hua Hin still has a quiet, relaxing atmosphere. The city attracts far more families and couples than solo travellers, making it a great choice for a relaxing weekend beside the beach or on the golf course. Thanks to its proximity to Bangkok, Hua Hin is a popular weekend destination for Thai families and expats. 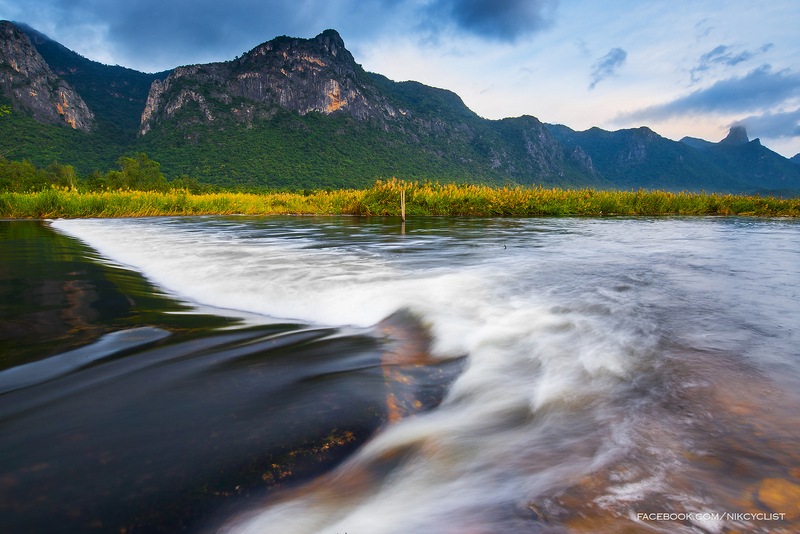 Nearby natural attractions like the stunningly beautiful Khao Sam Roi Yot National Park make the area around Hua Hin a great escape from the noise and bustle of Bangkok. Hua Hin Beach, a clean and attractive expanse of sand, runs north to south along the eastern edge of the city. Recliners and umbrellas are set up along the beach and for a small fee, are a convenient way to enjoy the sun and sand. 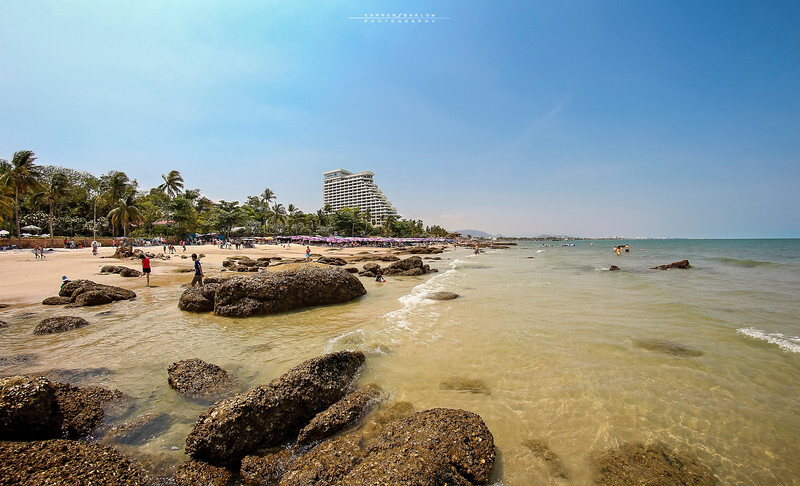 Many of Hua Hin’s luxury resorts back onto the beach, and the areas around the resorts tend to become crowded during the weekend. Head further south along the beach to get away from the crowds and enjoy some peace and quiet. Wat Ampharam is a small Buddhist temple located in the centre of Hua Hin. Although it’s less impressive than other temples in Bangkok and elsewhere in Thailand, Wat Ampharam’s great location in the centre of the city makes it an important meeting point and attraction. Located between Hua Hin Railway Station and Phetchakasem Road, Hua Hin Night Market is a small night market with a range of stalls selling everything from cheap clothing and accessories to fresh seafood, desserts and more. Like most night markets in Thailand, prices at Hua Hin Night Market can be inflated by 100% or more. If you’re looking for a bargain, be prepared to negotiate at least 30% off the marked price of clothes and other items. 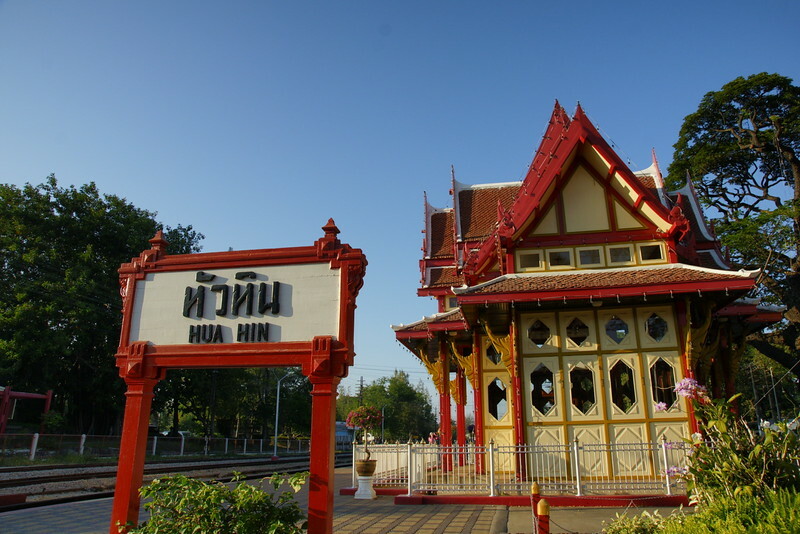 Thailand’s oldest railway station, Hua Hin Railway Station is a quaint and picturesque station on the western edge of the central city. The station’s classic design makes it a popular photography location for tourists and locals alike. Use the search box below to find out departure times and prices on your selected travel dates to Hua Hin. While Hua Hin’s beaches aren’t as spectacular as those found further south in Phuket or Krabi, there are several great beaches located close to Hua Hin. Hua Hin Beach is the region’s most popular beach, while Khao Takiab and Khao Tao offer a quieter, more peaceful experience. Although the beaches close to Hua Hin don’t offer much in terms of snorkelling, nearby islands such as Koh Talu are great snorkelling day trip destinations. Hua Hin Divers offers dive trips to several nearby islands and popular diving spots. Hua Hin’s consistent winds make it Thailand’s most popular kitesurfing destination. Lessons are available through Hua Hin Kitesurfing for kitesurfers of all skill levels, from absolute beginners to experienced kitesurfers. Hua Hin is one of Thailand’s most popular destinations for golfers, with a great selection of high quality courses located around the city. Banyan Golf Club (the 2009 Best New Course in Asia) and Black Mountain Golf Club are two of the city’s most popular golf courses. Thailand’s first national marine park, Khao Sam Roi Yot is a beautiful coastal national park that’s a short drive from Hua Hin. The park is most famous for Phraya Nakhon Cave, which contains a 19th century pavilion. Located right on Hua Hin Beach, the Dusit Thani Hua Hin Hotel is a luxurious five-star hotel with one of the best locations in the city. The hotel’s large beachfront swimming pool and selection of dining options make it a great place to spend a weekend. Originally named the Railway Hotel, the Centara Grand Beach Resort & Villas Hua Hin opened its doors in 1923. Renovated and expanded over the years, the hotel has three pools, a variety of luxurious rooms and a classic elegance that’s hard to find in newer resort hotels. One of Hua Hin’s most upmarket modern hotels, the Cape Nidhra Hotel offers a large selection of luxurious suites, all with their own private plunge pools. The hotel’s stylish design and great location right on the beach make it one of Hua Hin’s most relaxing and luxurious choices. Located close to Hua Hin Beach, Ruen Kanok Thai House is an affordable three-star hotel with a location similar to the city’s five-star resorts. This small boutique hotel with 10 rooms also has a swimming pool and beautiful garden grounds. Prinz Garden Villa Hua Hin is a small three-star hotel located in the centre of Hua Hin. The hotel, which is located a short distance from Hua Hin Bus Station, offers a selection of rooms and apartments with free Wi-Fi and an outdoor swimming pool. Remix Photo House Hua Hin is a stylish, unique and modern boutique hotel located in Hua Hin City Centre. The hotel is located a short distance from the beach and offers free Wi-Fi, a great café and excellent value for money. Located on Hua Hin Soi 53, Joe and Jacky Bed and Breakfast is a charming bed and breakfast that’s a short walk from Hua Hin Beach and the city centre. The hotel’s six affordable fan rooms offer little in the way of luxury but are well priced and comfortable enough for a short stay. Located a short distance from Hua Hin Railway Station and the night market, My Place @ Hua Hin is a conveniently located two-star hotel with a selection of simple but comfortable rooms. All rooms include free Wi-Fi. Tid Tarad Hostel Hua Hin is a budget backpacker hostel located close to Hua Hin Beach. While the accommodation on offer is simple (both dorms and private rooms are available) the hostel’s convenient location, fast Wi-Fi and friendly staff make it a great choice for budget travellers. Located on Phetchakasem Soi 100/1, Andreas Italian Restaurant & Grill is an upmarket Italian restaurant with a roof terrace offering views over the surrounding area. A European/Thai contemporary wine bar, Red Piano Restaurant and Wine Bar serves a diverse selection of well prepared dishes accompanied by live music. Located a short walk north of the Hilton Hotel on Hua Hin Beach, Oceanside Beach Club and Restaurant serves Mediterranean and Thai food with fantastic views over the ocean. 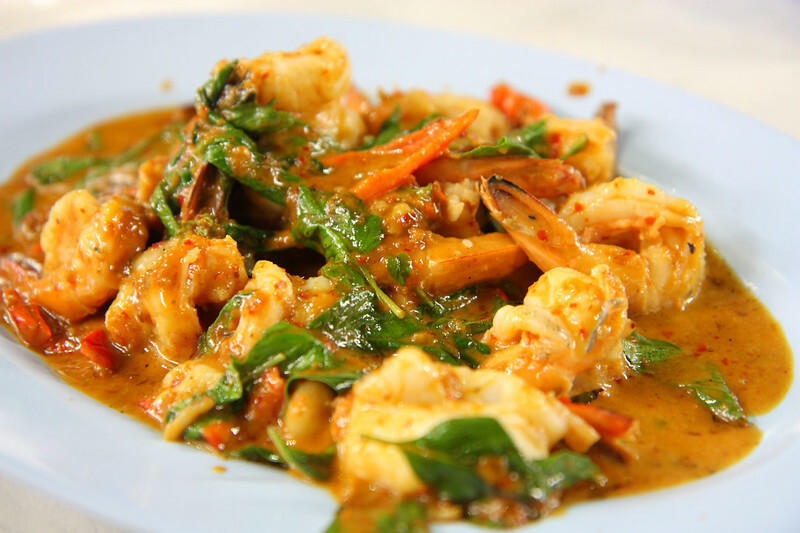 Cheap and tasty, Friendly Kitchen serves a great selection of classic Thai dishes at reasonable prices in a location close to the centre of Hua Hin. Hua Hin is packed with cafés, making competition fierce. Hua Hin 99 Cafe offers great coffee and a selection of tasty dishes ranging from fish and chips to falafel with hummus. Located down a small, quiet soi, Eco Cafe by SEA Harmony is a charming café that’s home to two friendly dogs. Meals range from simple, tasty Western dishes to well-known Thai food and high quality coffee. 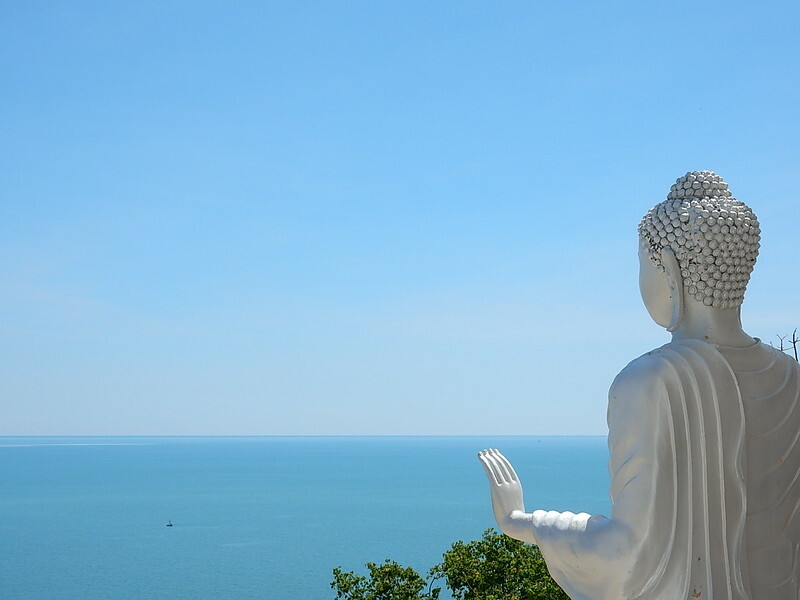 Hua Hin is approximately 200 kilometres from Bangkok and can be reached in less than three hours by bus. Buses leave from Bangkok’s Sai Tai Mai Bus Station and arrive in Hua Hin in 3.5 hours, depending on traffic and road conditions. Minivans from Victory Monument also travel to Hua Hin, making the trip in 2.5 to 3 hours. Note that the minivans tend to drive aggressively and can be quite crowded, making the bus a better option if you’re seeking a relaxing journey. Hua Hin’s charming historical train station isn’t just for decoration — trains connect Hua Hin and Bangkok on a frequent basis. Trains from Bangkok depart Hua Lamphong Station 10 times per day and complete the journey to Hua Hin in slightly over four hours. The nearest airports to Hua Hin are Bangkok’s Don Mueang International Airport and Suvarnabhumi International Airport. Check Skyscanner to compare airlines for the best prices and flight times to Bangkok.